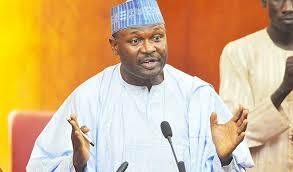 By Sadiq Umar – The Independent National Electoral Commission (INEC) Mahmood Yakubu, said the Commission has registered a total of 84,271,832 voters for the 2019 general elections. Mr Yakubu said it registered a total of 14,551,482 new voters in the last 16 months, from April 27, 2017 to August 31, 2018 in its nationwide Continuous Voter Registration (CVR). This is in addition to the existing figure of 69,720,350 registered voters, prior to this time. The INEC chairman said the Commission would print 16,500,192 Permanent Voters’ Cards (PVCs) and make them available for collection by citizens ahead of the general elections. He made the disclosure at a meeting with the Resident Electoral Commissioners (REC) on Thursday in Abuja. “In addition to fresh registration, the Commission is also processing 769,917 requests for intra and inter-State transfers as well as 1,178,793 requests for replacement of lost, damaged or cards with misspelt names or incorrect personal details of voters as required by law,” he said. Mr Yakubu appealed to Nigerians to seize the opportunity of the ongoing nationwide display of the particulars of new voters for claims and objections as required by law. “By doing so, citizens will be helping the Commission to further clean up the register and purge it of all ineligible registrants as required by Section 12 of the Electoral Act. Mr Yakubu said the meeting would consider consequential steps the commission needed to take as it continues to prepare for the 2019 general elections. He said the Commission would also consider options to fast track the distribution of the PVCs before general elections, including the devolution of collection to Ward level. On the commission’s preparation for the Osun State Governorship election, Mr Yakubu said all processes and activities were going according to our timetable and schedule of activities released almost a year ago. Mr Yakubu said the Commission had been working on a multi-faceted approach to the menace of vote-buying and other sundry electoral malpractices. “Furthermore, we are working with the Inter-Party Advisory Council (IPAC) and other stakeholders on voter education and sensitization.